I thrive on culture shock – it engages my senses and is intensely stimulating. I love arriving in an unfamiliar country and experiencing the sites, the sounds, even the unusual odors! I long for days, even weeks, where life is in sharp contrast to my own. 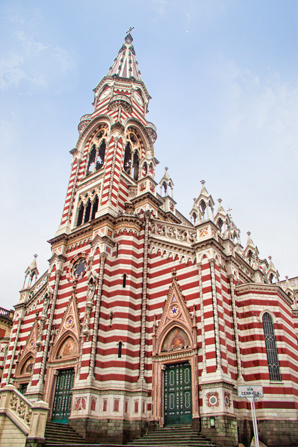 On the occasion of my trip to Colombia, my parents and eight other daring adventure seeking souls accompanied me. My parents inspired my love for travel – naturally, they are one of my favorite companions. Before I left, everyone I told questioned my judgment. I’m used to the reaction – it is the usual response I get for most of the places I have traveled. I don’t try to explain anymore. Instead, I offer this quote. 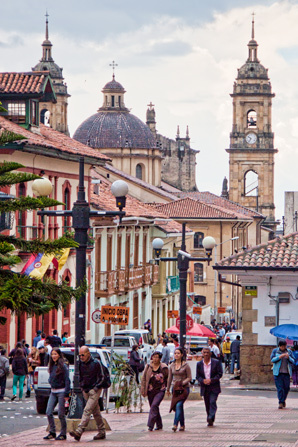 For this trip, the dancing lesson started in Bogotá, the vibrant capital of Colombia. 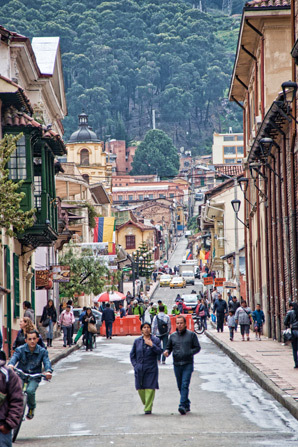 We stayed in La Candelaria, the oldest district and historical center. The neighborhood is full of cobblestone streets and centuries-old houses. 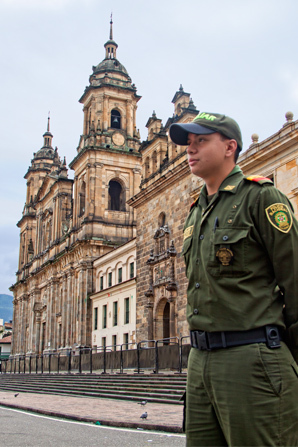 Bogotá has gone to great lengths to change its crime rate and its drug-war battlefield image after being considered to be one of the most violent cities in the world in the mid-90’s. 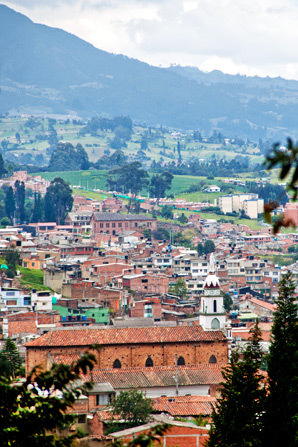 In 2012, the crime rate per capita shows that Bogotá is less violent than Chicago. One of the things I loved about this hip, bohemian city was the graffiti. There is a whole range of raw emotions revealed in the colorful street art. 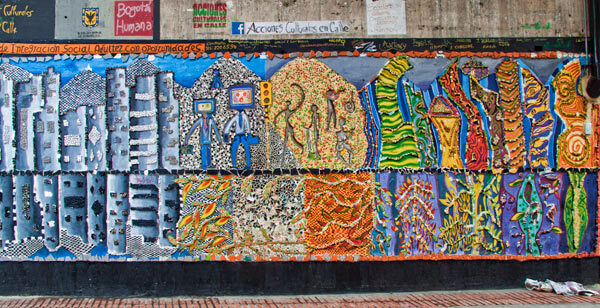 I think the mosaic (pictured below) best sums up Bogotá. The gray mosaic on the left signifies decades of civil conflict. The middle section is the intervention and comeback of the people. 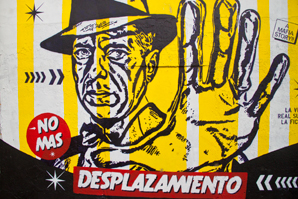 The last panel is the colorful transformation and vibrant future of Bogotá. 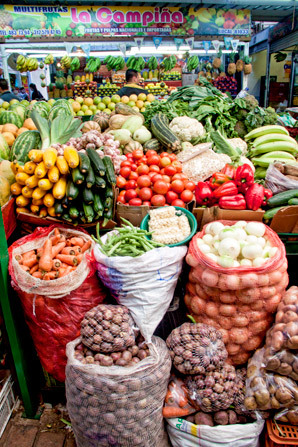 The gorgeous produce that comes from Colombia could inspire all of this colorful artwork. Visiting the local farmer’s market was a vegetarian’s paradise. and maybe the roasted ants. Now if I had seen these ants in my hotel room I would have called them rodents and demanded a discount. Instead, I happily ate them and enjoyed their salty Cornut taste and texture. Even my father who is a picky eater (understatement) ate one and liked it. 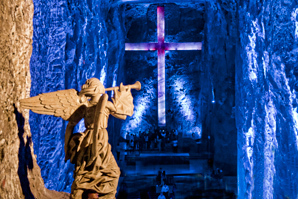 Outside of Bogotá, we visited the Salt Cathedral of Zipaquirá; an underground Roman Catholic Church built within the tunnels of a salt mine. The entrance looks like you are walking into a nightclub and not a church. After visiting 14 Stations of the Cross (small chapels) I knew this was a sacred place. After walking underground for a couple of hours we worked up an appetite, and ate at a Parque Restaurante, a restaurant in the nearby town of Funzipa. 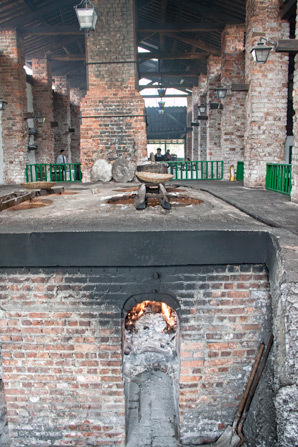 The restaurant has functioning salt ovens where they can process their own salt from the local mines. We were served a traditional, local favorite soup called Ajiaco Bogotano – (Chicken and Potato Soup, Bogota Style). 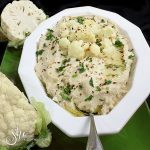 It is made of chicken, potatoes, and flavored with a locally grown herb called “guasca“. 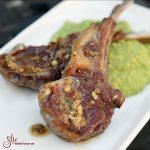 Traditionally, cream and capers are added just before eating, and its condiments are white rice, and avocado. 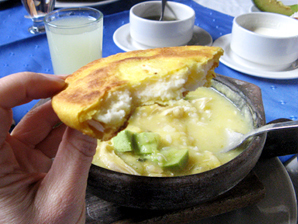 It was accompanied with a cornmeal bread stuffed with fresh cheese, called Arepa. It was a deliciously satisfying meal. One bite of the soup, and I knew that I had to recreate it. I hope you enjoy it as much as I do. 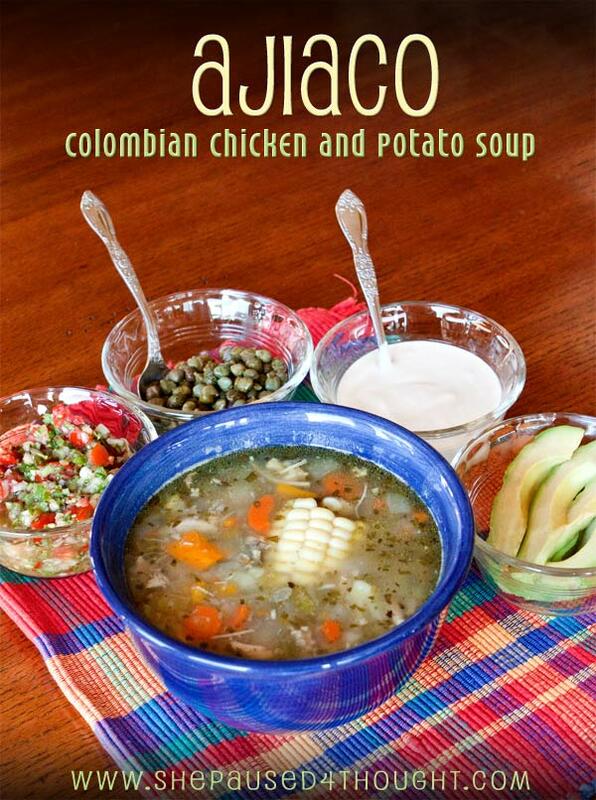 Ajiaco is a typical soup in Colombia with chicken and potatoes. Its unique condiments makes this soup one of my new favorites. Put the avocados, sour cream, capers and cilantro leaves in small bowls and set them on the table along with the bowls of shredded chicken and the aji. Reheat the soup if necessary and ladle it into large soup bowls, putting a quarter ear of corn in each bowl. Let your guests add the garnishes and the aji as they like. The soup and the aji can be made a day ahead. To me, chicken soup contains the flavors of “home” wherever it’s assembled, eaten and enjoyed! 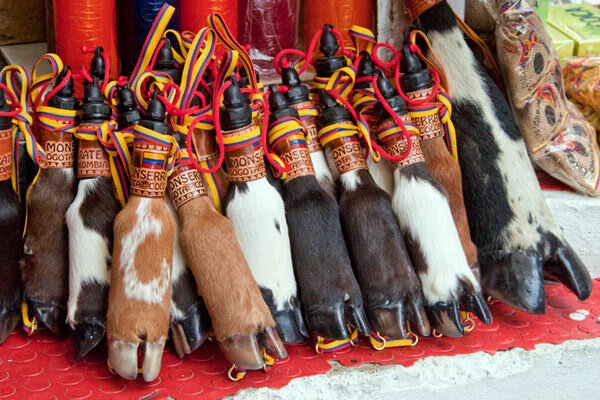 If you only go to Colombia for the food you won’t be disappointed… although the souvenirs came a close second. P.S. I think the Columbians have a “nothing wasted” philosophy. I believe there is much to learn from that viewpoint. 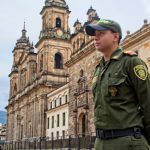 I was eagerly awaiting your posts about Colombia and this one made me feel like packing my bags and taking off. 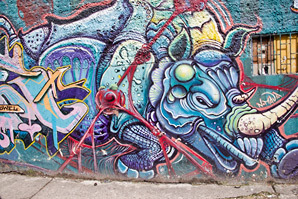 Love the photos of graffiti!! This ancient practice can be found in any city and amongst the oldest ruins and it provides an insight into a city or place. I await with bated breath for more posts. Thanks Judy. I am still going through photos and trying different Colombian recipes. I can’t say enough good things about traveling in this unique country. More pictures and posts coming. 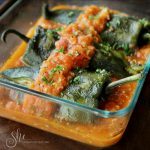 There is so much to show and wonderful recipes to feature. I have made this soup three times in the last two weeks and need to explore other Colombian recipes, but I keep coming back to this one. It is simply that good. Beautiful story. The soup was delicious! I found the guascas at a specialty market. 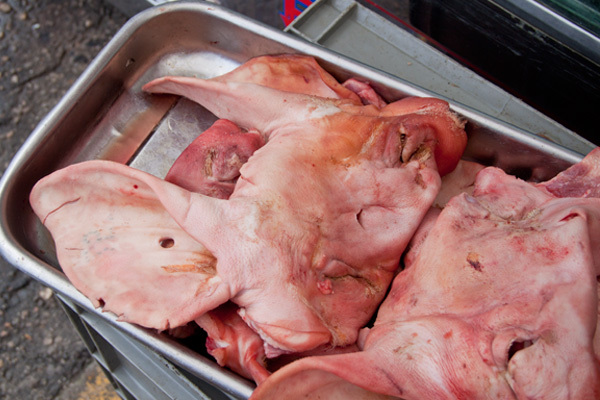 Can’t wait for the next installment…as long as it doesn’t include pig ears! So glad you enjoyed the story. 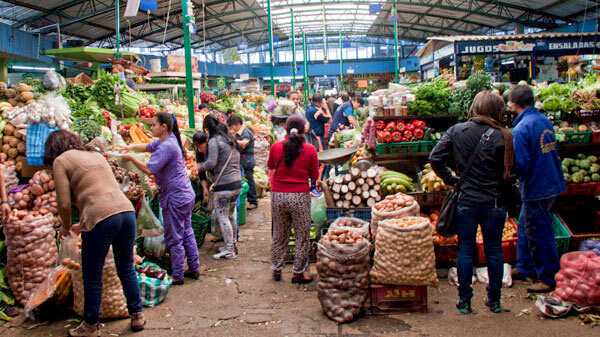 Which market did you find the guascas at? So fun to see your amazing jaunt through Columbia! The graffiti is brilliant! 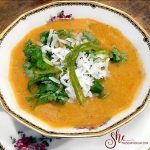 And your Ajiaco soup is a work of art! I love everything you captured with your lens following the esteemed tradition of nothing wasted. Thanks Leslie. You would love Colombia. It a very art-inspiring country. I love your sense of adventure. Thanks for sharing your story of Colombia with us all. I love travelling. I got a similar reaction when I told people I was going to Mexico for vacation. Yet, the people of La Paz around the Sea of Cortez were refreshingly friendly and I felt no sense of uneasiness. Looking forward to hearing more about your journey. You are welcome. I am sure La Paz was fabulous as well. 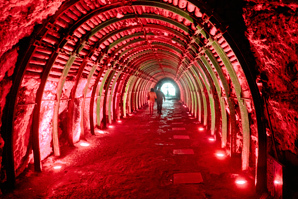 Visually stunning photos… I would have never guessed Colombia so interesting! I always love your courage… ants??? What next??? Thanks Cheri! Colombia exceeded my expectation as well. I can’t wait to go back. Cathy, what amazing images of your travels. 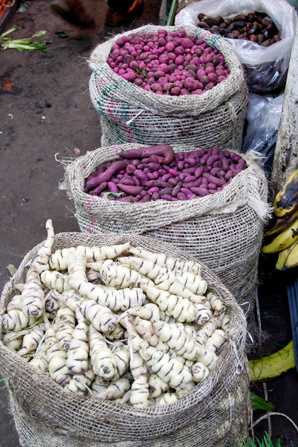 I can’t tell you how much I’d love to step into that produce market — would make my heart race with excitement. (Only another foodie would understand that.) And of course, I’m left wanting to, a) get to Columbia, and b) eat that soup! 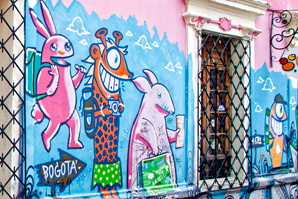 Wonderful post about your trip to Bogota and the interesting things you saw and ate! Wow! I don’t know which is more surprising: the underground Catholic church or the ants being tasty! You are an inspiration! I have a question for you: are you going to re-create those incredible looking cheese filled Arepas? Oooh!! Love! Your Dad is a real trooper. Can’t go wrong with chicken soup. Mmmmmmmmm. I love your blog! 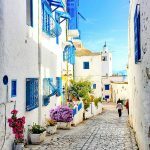 What interesting travel photos. Makes me wnat to jet off to Columbia right away. 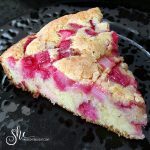 This recipe looks delicious, too. Wow… Looks like an interesting trip! I do believe that the images we get from a country are usually not the best and in the case of Colombia I’m pretty sure we only get to see the violent part, so love that you decided to go and show us another side. Love that graffiti.. Beautiful! And those ants!! My god, they are HUGE! 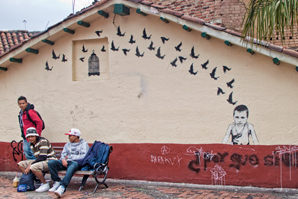 Simone, you would really appreciate the artistic side of Colombia as well as the food. I have never seen ants that big anywhere else in the world. 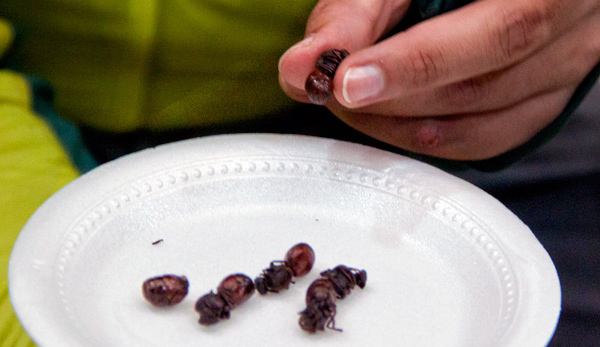 I have eaten honey ants in Australia, but only their honey-filled body was big.